Do you feel torn between your work and your family? 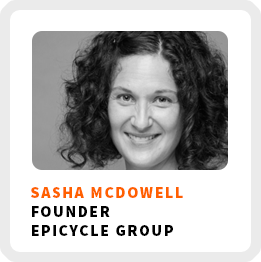 Sasha McDowell dealt with that dilemma for years before she finally decided to build a business of her own to meet her needs for both money and time flexibility. She wants to share how to create meaningful work to be an engaged parent. She’s the founder of the Epicycle Group which helps parents balance their family lives with entrepreneurship, as well as helping companies to build workplaces that fosters more meaningful careers and engaged parenting. How Sasha made a career change after having her first child. Why you might want to take care of your short-term financial needs before starting a business. Why you can think more creatively when you aren’t worried about money. The biggest challenges parent entrepreneurs face. Definition of success: Feeling good, content, and a sense of joy from living life according to values. As well as seeing her business grow and making an impact in the world. Regains focus by: Play tasks against each other by doing the things that seem appealing and then going back having made some progress in another area and exercising. Scheduling work time as a parent: Setting clear boundaries and working in the morning or whenever she can get a break. 90-day goal: Continue to provide quality coaching to clients, diversifying clients, meeting with different people to find where she can meet entrepreneurs who work in her groups, and analyzing the programs to identify who can benefit the most. 1) Bear down, stay in the job, and try to launch the business on the side and transition into your business over time. 2) If your job is hampering your creativity, think about finding a different job that doesn’t drain you as much while you work on your own business. 3) Think about what the business you want to start is, how quickly it can get off the ground, and how long it might be before you can get paid from it.